We, SAHIL GRAPHICS, based at Ballabgarh, Faridabad, India an established Suppliers & Exporters of superior quality Automatic Double colour Sheet Fed Offset Printing Machines / Two Colour Sheetfed Offset Printing Machine / Multicolor offset printing machines from the heart of India. A sturdy and simple design for easy maintenance. Its compact size simplifies changeover and make ready and makes the SAHIL Two Colour Offset is perfect for tackling short-to-medium run jobs. SAHIL 225 / 228 bi-Colour sheet fed offset machines have an excellent reputation for its advanced features & un-complicated high quality production compare to imported, rebuilt or used printing machines. The proven 20-Roller inking system ensures smooth, even ink flow to the form rollers for extraordinarily high quality reproduction. Sturdy construction, bearer contact, improved pull side lay & three large form rollers of varying diameters for superior ink distribution ensure high quality dot sharpness & top printing quality. All cylinders are cast in one piece and are of treated alloy cast iron and hard chrome plated. Stream Feeder gives smoothest control of each sheet as it approaches the feed board. Double sheet detector & no sheet detector are provided on feed board for safety. The SAHIL 225 / 228 Double Colour Offset adds multicolor capability to the productivity and profit potential. Whether it is for print-for-profit or in-plant, a well-deserved reputation for high print quality will add to the job opportunities. 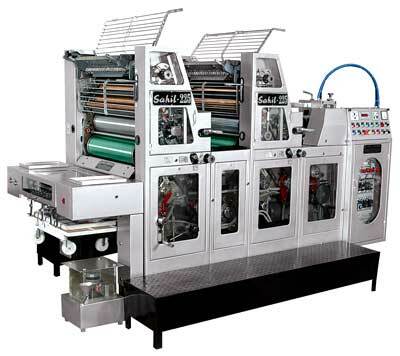 Low Investment : The SAHIL two color offset gives you good value at a very attractive investment cost. Easy servicing, reliability and long service life all contribute to optimal pay-off. Ease of Operation : The SAHIL double colour offset is a user-friendly Reliable press, sturdy and easy to operate. it offers uncomplicated and fast plate changing with ergonomic & well tested design. Top Printing Quality : Sturdy construction, small cylinders, bearer contact and large form rollers ensure perfect dot sharpness. High Productivity : The SAHIL Solna type double color offset offer short make-ready times with a quick change of plates and possibilities of handling a great number of small and medium runs in minimum time. Full safety covers and guard and many more. Machine Sizes : 18"X25" & 18"X28"
Printing Sheet Size Max. 460x640mm 18"x 25" 460x715mm 18"x28" 20"x30"
Sheet Size Min. 240x280mm 9"x11" 240x280mm 9"x11" 12"x14"
Printing Area 445x636mm 17.5"x25" 445x711mm 17.5"x28" 19.5"x30"
Gripper Bite Gripper Margin 9.0mm 5 to 8mm 0.354" 0.195" to 0.315" 9.0mm 9.0mm 5 to 8mm 0.354" 0.195" to 0.315"
Plate Size 510x645x.30mm 20"x25.5" 510x720x.30mm 20"x28.5" 22"x31"
Blanket Size 570x645x1.7mm 21.25"x25.5" 570x725x1.7mm 21.25"x28.5" 24"x31"
Feeder Pile Height 800mm 31" 800mm 31" 33"
Delivery Pile Height 410mm 16" 410mm 16" 17"
Floor Space Length x width Height 2900x2030/ 4600x2160mm 1650mm 114"x80"/ 181"x85" 65" 2900x2100/ 4600x2200mm 1650mm 114"x83" / 181"x86" 65" 120"x86"/ 200 X 70"